Philadelphia Police and the FBI are investigating a robbery that took place at the Philadelphia Federal Credit Union branch in the Student Center lobby Tuesday, Dec. 9 around 4:30 p.m. 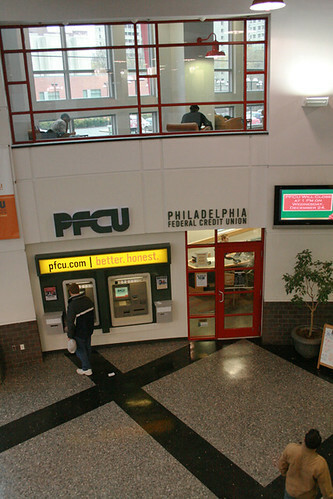 The PFCU branch in the Student Center was robbed yesterday afternoon (Dan Dat Nguyen/TTN). Campus Police described the suspect, who presented a demand note to a teller and made off with a small amount of cash, as a light-skinned African American man in his mid-50s to early-60s. In still shots taken from the credit union’s cameras, the 5-foot-7 to 5-foot-8 man is wearing a brown or tan jacket, a tan knit hat, blue jeans and thin-framed glasses. “The [Student Center] is a public access building. You’ve got the credit union, the travel agent, the bookstore, the post office and the food courts all open to the public,” said Campus Safety Services Executive Director Carl Bittenbender, adding that Campus Police responded to the incident and will aid in the investigation. Bittenbender said police have not released the amount of cash stolen, but that it was not substantial. Both Bittenbender and PFCU spokeswoman Karen Eavis said nobody was hurt in the incident. Bittenbender said there was no weapon involved. Kriston Bethel contributed to this article. One lucky student used his “Rock, Paper, Scissors” skills to score a spring break trip and the chance to win $20,000. Well that was some disturbing news to hear. the financial crisis has brought people to a very bad condition. may be the person who robbed was one who was affected very badly. and nothing else to other than rob a bank.